Have you busted out your jean jacket from the back of your closet yet? You totally should. I've been loving mine lately, and really like how I can make so many outfits from just 1 jacket. Linking up with Kristen, Shanna, Lauren, and The Pleated Poppy. I love how you wear your jean jacket! I don't have one, but you can bet when my anti-shopping spree is over I'm getting one...and a maxi skirt. I forget about mine! Thanks for the reminder! Is it okay that it's sorta cropped??? I have that same mustard scarf......thanks for the styling idea!!! Gorgeous! Such a staple in my wardrobe (but the weather right now is FREEZING and flurries). I love the red pants combination. You are the cutest mom out there! I've been waiting till it gets a little warmer, but I can't wait to break mine out...and seeing all your cute outfits makes me wish warmer weather would hurry the heck up so I could! The second one is my favorite. Lovely looks. I love the versatility of a denim jacket. 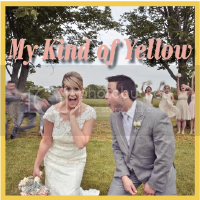 I especially like it over a dress, like your second picture. I always forget to wear my jean jacket!! love this, you can wear it with everything! it's the magical and most perfect scarf! love it. i LOVE the second look the most! i can't wait for spring to arrive! The third look is my favorite! I have always wanted to rock a maxi skirt but I'm afraid I am a bit too short haha! I love it! I bought my jean jacket 9 years ago and at one point in my life would have laughed if you told me I was going to wear it again one day. Glad I didn't give it away because I wear it all the time! These looks are great on you, especially love it with the maxi skirt. so cute! 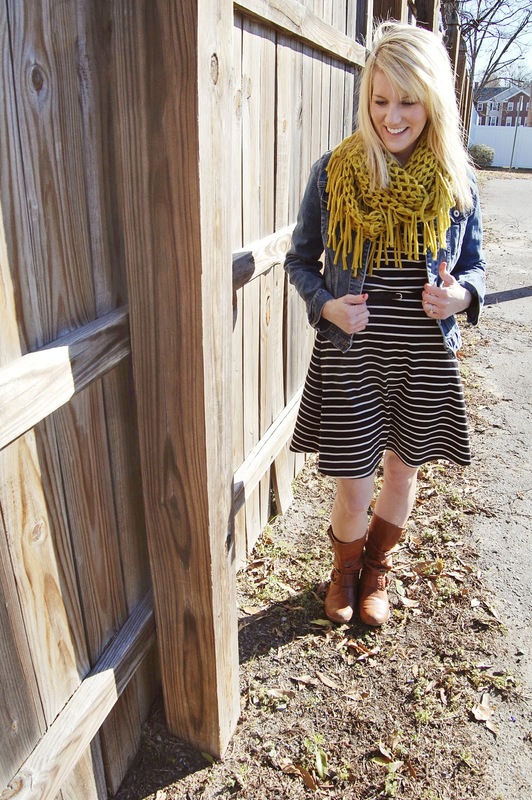 i love the mustard scarf! i'm ready for some warmer weather so I can wear my jean jacket over maxi dresses! girl i keep wanting to break out my jean jacket it, but i don't know where it went, ahhh. this is driving me crazy! I love me a good ole jean jacket :) Cute outfits! CUTE!! I love my jean jacket(s) yes I have two! A lighter denima nd darker demin! Just bought my second black maxi dress for this upcoming sprinf/summer cant wait to wear it! I love the third one, this is a perfect transitional outfit. I wish it was warmer so I could wear this outfit. :) I love how you make closet staples so versatile, thanlks for the ideas! I know I have one some where..... These look great on you. I love that dress! Cute! I need to break out my denim jacket. I love your second look! You always have the best style! I love the ways you styled the jacket - I would wear every look! I love that you are rocking that jacket. I need to get more blazers and jackets! I also love that it's warm enough where you live to just rock that jacket and some flats. Send me some sunshine. I think I got rid of mine about 7 years ago--- obviously should not have. jean jackets are back and i'm sad because i got rid of mine a few years ago. i know i shouldn't have, they're so versatile. your three looks are super cute! These are such great looks! 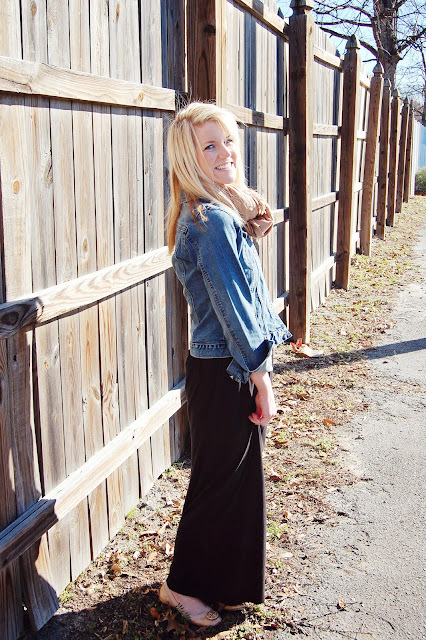 Being a collector of maxi skirts, I'm a fan of the last outfit :) you pull it off so effortlessly! I actually do not own a jean jacket. Great post. I love seeing how to use versatile pieces in different ways. This has made me miss having a denim jacket. Maybe that'll be on my shopping list for springtime. cute :) love the yellow scarf! 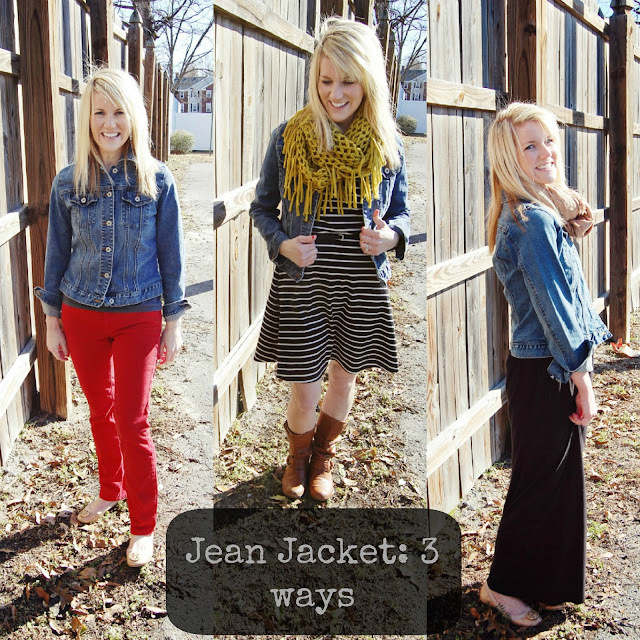 love the versatility of a jean jacket! you styled it so well! my favorite is the second outfit with the mustard scarf...perfect! I wear my jean jacket with everything!!! Well, except JEANS. I'm not a fan of denim on denim! Amazing looks girl, my favorite has to be the last one. This post makes me want to pull out my jean jacket!! Stopping by from The Pleated Poppy! I love my denim jacket! Who would have every thought the would make a comeback!?!? Not me!! LOL! Love all three looks, lady! I never thought about wearing my jean jacket with my sassy red pants. Thanks for the inspiration! love it all! Jean Jackets are so classic! found you via WIWW. i don't wear denim jackets but I think these looks are cute, especially the second one. i kinda want a fringe scarf now! Jean jackets are so classic, right?!? I totally forget about mine and I'm too thrilled about this reminder. Thanks, Ashley, I'm about to rummage through my closet NOW! Love all of these looks, but the second one is my favorite! Your scarf is so pretty! Oh my goodness. girl. You are too cute! I love your style and super cute spin on fashion! I'm a happy new follower, and can't wait for more fun posts!! I linked up my photos of my new jean jacket! I have NEVER owned one before and now I love it! I am so pulling out my jean jacket after this! I LOVE the buttoned up look....maybe tomorrow! 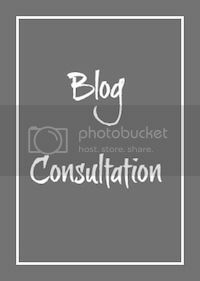 How have I not seen your blog?! I love the design and the fonts you've used! Thanks for a great styles post, I love my denim jacket and this is great inspiration! New follower for sure! Found you from the Style Elixir link up! All three looks are fabulous! Hey sweet friend! You can rock the jean jacket for sure!!! I love wearing mine but can't seem to shake the early 00's vibe it gives me. :) I'm old. 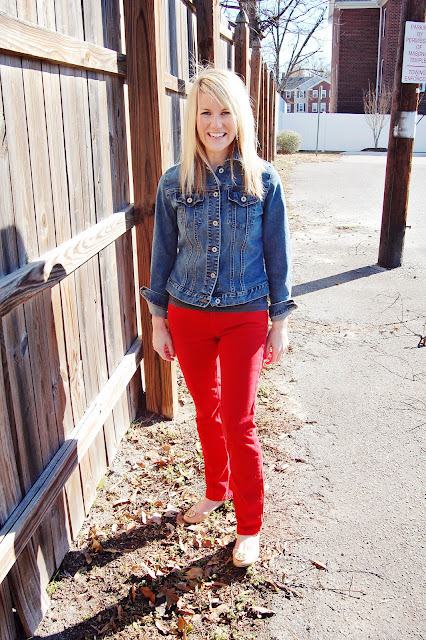 So I was so inspired by your cute denim jacket...I wrote a post about wearing mine. thanks so much for the idea! You and your family are BEAUTIFUL!